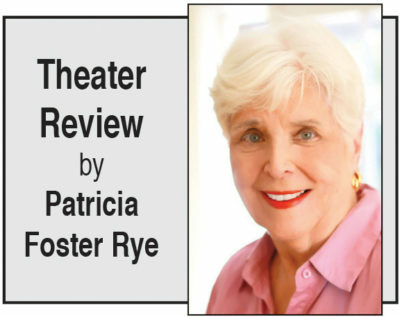 In a Booth at Chasen’s, The Real-Life Hollywood Romance of Ron and Nancy Reagan, book by Sam Bennett, music and lyrics by Al Kash and Phil Swann, directed by Kay Cole, is a love story. The year is 1949, and Ron (Brent Schindele) and Nancy (Kelley Dorney) meet on an arranged first date at Chasen’s, the building’s exterior and interior lovingly reproduced by scenic designer Andy Walmsley. According to the program, the booth used in the show originally came from the restaurant. That first encounter begins Ron and Nancy’s relationship, and we follow it through 1952, each milestone chronicled and supported by the score and lyrics. The music is melodic, the lyrics pitch-perfect. Ron’s leadership as Screen Actors Guild president (his early political experiences) is touched on, and his presidential accomplishments are highlighted by a final visual projection designed by Daniel Brodie. Director Cole has developed the humor and heightened the affection between this most-famous political couple. And she has interspersed the evening with some effective and pitch-perfect choreography. Ms. Dorney and Mr. Schindele have captured the essence of their characters without relying on stereotypes. No matter what your political position, this lovely show is not to be missed and is a very entertaining evening in the theatre. Valley of the Heart, written and directed by Luis Valdez (creator of “Zoot Suit”), takes place between 1941 and 1945 in Santa Clara, California and Wyoming. The story centers on the Montaños and the Yamaguchis, two families caught in the tragedy of World War II. Their oldest children, Benjamin Montaño (Lakin Valdez) and Thelma Yamaguchi (Melanie Arii Mah) fall in love just as the attack on Pearl Harbor signals the start of the U.S. involvement in World War II. Internment of all Japanese and Japanese Americans in California follows. A dark chapter in this nation’s history, much of this material (the horrific living conditions, the required loyalty oath) has been covered in earlier Los Angeles productions. As the families are separated (the Yamaguchis as far as the Heart Mountain Relocation Camp in Wyoming), the love story blossoms. The brilliant set design by John Iacovelli and projection design by David Murakami delineate the action. The balance of the cast give performances at varying levels of ability. Director Valdez has added fully black-clad, Noh-like stage hands to ensure the smooth scene changes and to heighten the drama. Hughie and Krapp’s Last Tape. Hughie by Eugene O’Neill is the first act, and Krapp’s Last Tape by Samuel Beckett is the second act. Hughie takes place in a hotel in New York City in the summer of 1928 with effective scenic design by Sibyl Wickersheimer. Erie (Mr. Dennehy) is complaining about the loss of Hughie, the former night clerk. He blames his reversal of fortune on the death of Hughie. His sympathetic listener is Charlie Hughes (a terrifically understated Joe Grifasi), the new night clerk.